Aim: To determine the correlation between the results of thyroid fine-needle aspirations interpreted using the Bethesda system and final histopathological reports for patients at an oncology hospital (OH) and non-oncology hospitals (NOHs). Materials and Methods: A retrospective, cross-sectional, descriptive study was performed to compare the cytology and histopathology results for patients with thyroid nodules in three Colombian hospitals. The final correlation of diagnoses between the two methods is reported. In Colombia, the health system provides the existence of general care hospitals and hospitals specializing in care of patients with cancer. Results: A total of 196 reports were reviewed, of which 53% were from OH and 47% were from NOHs. A greater proportion of category V (37.5%) was diagnosed at the OH, whereas NOHs diagnosed a greater proportion of category II (42.3%). The global correlation between diagnoses made using cytology and histopathology was 93.3% for categories V and VI (based on the final malignant diagnosis) and 86.9% for benign category II. Significant differences between institution types were observed when category IV and V and malignant histopathology were compared (56.3% OH vs. 23.5% NOH; P = 0.05 for category IV, 97.4% OH vs. 82.3% NOH; P = 0.03 for category V), while no significant difference between institution types was observed when category II and final benign diagnosis were compared (P = 0.6). Conclusions: The Bethesda system for thyroid cytology correlates adequately with final histopathological diagnosis in Colombia. Significant differences were identified in the diagnostic correlation for malignant lesions between the OH and NOHs in categories IV and V caused by selection bias of the population. In Colombia, the health system provides the existence of general care hospitals and hospitals specializing in the care of patients with cancer. In both types of hospitals, there are trained cytologists and pathologists for the diagnosis of the most common diseases, and it is supposed that an oncologic pathologist outperforms the general pathologist in the cytological diagnosis of thyroid samples. Few studies have been published on the implementation of the TBSRTC in Colombian health institutions and its diagnostic correlation with final histopathological results. The objective of this study was to determine the correlation between diagnoses made based on FNA results interpreted using TBSRTC and the final histopathological diagnosis for patients at oncology hospitals (OHs) and non-oncology hospitals (NOHs). Pathology laboratory archives from three different institutions were reviewed. A cross-sectional study was designed using FNA results of patients with thyroid nodules classified based on the TBSRTC for whom histopathological reports on the resected surgical lesion were available (n = 196) and who were treated between 2010 and 2012. The study included 104 (53%) patients at an OH, in Bogotα, and 92 (47%) patients at NOHs in Bucaramanga and Bogotα, Colombia. Frequency measures are reported for the categorical variables and central tendency and dispersion measures are reported for continuous variables. In addition, frequency tables were constructed for each category in TBSRTC for comparison with the final histopathological report. Values of P were calculated using Fisher's exact test. A total of 196 patients were included in the study, 174 of whom were women (88.78%), with a mean age of 50.8 years (range: 14-88 years). Details of the other characteristics of the population are presented in [Table 1]. Malignant, 16.3%. When grouped by OH and NOHs, more categories V, SM and VI, malignant (68.3%) and less category II, benign (6.7%) were diagnosed at the OH, whereas more benign FNA results (42.4%) were obtained at the NOHs, followed by category V, SM (37%) and category IV, follicular neoplasm or suspicious for a follicular neoplasm (18.5%; [Table 2]). About the histopathological diagnoses, 64.3% were malignant and 35.7% were benign. The most frequent benign diagnosis was goiter (20.4%) and the most frequent malignant diagnosis was papillary carcinoma (59.7%). When the results were compared based on type of hospital, the OH made a final malignant histopathological diagnosis in 83.6% of cases, whereas NOHs made a final malignant diagnosis in 42.4% of the cases [Table 2]. 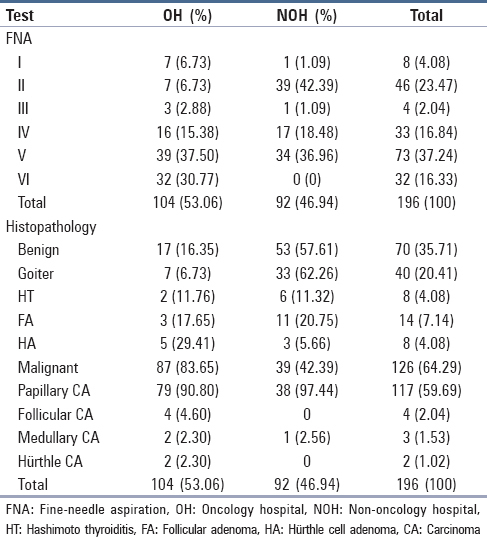 When the results of FNA and histopathology were compared, FNA categories V and VI were associated with a histopathological malignancy frequency of 90.4% and 100%, respectively (this last category was not used for any FNA at the NOHs), while category II, benign, was associated with a benign histopathological diagnosis in 86.9% of all cases. With respect to category IV, follicular neoplasm or suspicious for a follicular neoplasm, 39.4% of cases were associated with a final malignant histopathological result [Table 3]. A comparison of FNA with histopathology results based on institution type revealed that FNA category V was associated with a higher frequency of final malignant histopathological results at the OH (OH 97.4% vs. NOHs 82.3%; P = 0.03). 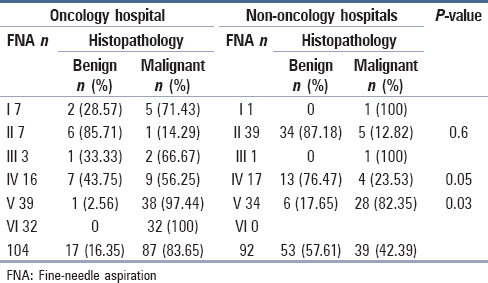 For benign category II FNA, no significant difference between type of institution was observed when correlations between final benign and malignant histopathological results were compared (OH: 85.7% benign and 14.3% malignant vs. NOHs: 87.2% benign and 12.8% malignant; P = 0.6). For a FNA follicular neoplasm or suspicious for a follicular neoplasm category IV, a greater proportion of benign results were obtained at the NOHs (76.5% NOHs vs. 43.8% OH), and a greater proportion of malignant histopathological results were obtained at the OH (56.3% OH vs. 23.5% NOHs; P = 0.05) [Table 3]. TBSRTC is a unified system that complements cytological findings from thyroid FNA and represents a consensus among multiple experts in different areas of medicine. In Colombia, implementation of TBSRTC at a single institution that specializes in the treatment of cancer patients revealed an 89% correlation with the final histopathological report for multiple malignant lesions;  however, the sample size and the population selection bias limits the external validity of these results. No data are available on the diagnostic correlation between TBSRTC and the final histopathology report in NOHs in Colombia and whether there are differences in the implementation of TBSRTC and diagnostic accuracy among pathologists and cytologists with more training in the diagnosis of cancer at OH and those trained in diagnosing general diseases at NOHs. In this study, histopathology and cytopathology results were compared for the same thyroid lesions in patients at three different health institutions: One OH and two NOHs. 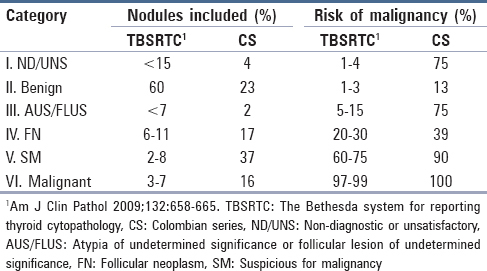 All institutions participating in the study used TBSRTC for the interpretation of FNA; however, at the NOHs, cytopathologists did not use category malignant in their FNA reports regarding the characteristics of the study population in these hospitals, which have a relatively low frequency of carcinomas, producing distrust of the use of the category. We do not take into account the percentage of incidental papillary carcinoma in the resections for analysis. The distribution of FNA categories and the distribution of pathologic diagnoses were analyzed. Differences in the two stratified populations were observed. Histopathological and cytopathological diagnoses of benign lesions were frequent in the NOHs, whereas diagnoses of malignant neoplasms were more frequent in the OH. Comparison of the distribution of the samples in each TBSRTC category with previous reports ,,, reveals similarities in the proportion of FNA category III AUS/FLUS (2% vs. 3-3.2%). These results reflect a strict adherence to the established criteria for this category and contradict the general belief that this category represents a catchall for those cases that cannot be classified as any other category. Our data differ from those in the literature for the relative frequencies of categories II, benign (23.5 vs. 64.6-73.8%), V, SM (37.2% vs. 1.3-2.6%) and VI, malignant (16.3% vs. 5.2-7.5%). The distribution of cases in this study indicates a greater proportion of malignancies and a reduced proportion of benign results. The malignancy rate was 64.29% in the whole series. As the incidence of thyroid carcinoma is 5.1 per 100,000 persons per year in Colombia, this high rate of malignancy may be attributable to the population selection bias. The proportion of category I, ND/UNS cases in this study is lower (4.1 vs. 10.4-11.1%) than that reported in similar studies ,,, ; however, the proportion of cases treated in the OH was greater than in the NOHs (6.7% vs. 1.1%). TBSRTC assigns a risk of malignancy to each category in an ascending manner. In our series, this tendency is preserved, but the frequency of malignancy was greater for all categories when compared with TBSRTC,  particularly for category III, AUS/FLUS (75% vs. 15% of TBSRTC; [Table 4]). Notably, only four of 196 FNAs were included in this category and, of these cases, three patients were judged to have carcinoma as the final histopathological report. The results of recently published studies demonstrate that the malignancy frequency for nodules classified as category III AUS/FLUS is greater than that estimated by TBSRTC, , and a review of the guidelines and clinical protocols for TBSRTC is advised. In conclusion, for the interpretation of aspiration cytology of thyroid lesions in Colombia, TBSRTC is a useful tool that enhances the diagnostic accuracy of FNA, exhibits an adequate diagnostic correlation with the final histopathological examination and enables a comparison of results between different institutions. Significant differences in the diagnostic correlation of FNA between the OH and the NOHs in the study were observed, specifically for the percentage of malignancy in categories IV and V. It can be caused by selection bias of the population that consults each type of hospital and also by a cognitive bias of the pathologists who favor malignancy or benignity based on their own workload. Cibas ES,Ali SZ;NCIThyroidFNA State of the Science Conference. The Bethesda System for reporting thyroid cytopathology. Am J Clin Pathol 2009;132:658-65.
Cooper DS,Doherty GM,Haugen BR,Kloos RT,Lee SL,Mandel SJ, et al. ; American Thyroid Association (ATA) Guidelines Taskforce on Thyroid Nodules and Differentiated Thyroid Cancer. Revised American Thyroid Association management guidelines for patients with thyroid nodules and differentiated thyroid cancer. Thyroid 2009;19:1167-214. Richmond BK,O′Brien BA,Mangano W,Thompson S,Kemper S. The impact of implementation of the Bethesda System for reporting thyroid cytopathology on the surgical treatment of thyroid nodules. Am Surg 2012;78:706-10. Romero-Rojas A, Melo-Uribe M. Implementation of the Bethesda system for cytology reporting of thyroid fine needle aspirates with histological follow-up: Experience in a cancer treatment center. Rev Colomb Cancerol 2014;18:3-7. DeLellis R, Lloyd R, Heitz P, Eng C. World Health Organization Classification of Tumours. Pathology and Genetics of Tumours of Endocrine Organs. Lyon: IARC Press; 2004. p. 50. Bose S, Walts AE. Thyroid fine needle aspirate: A post-Bethesda update. Adv Anat Pathol 2012;19:160-9. Globocan 2012: Estimated Cancer Incidence, Mortality and Prevalence Worldwide in 2012. Available from: http://www.globocan.iarc.fr. [Last accessed on 2014 July 17]. Garavito G, Llamas A, Cadena E, De Los Reyes A, Hurtado G, Rojas L, et al. Differentiated Thyroid Cancer Multidisciplinary Management at the Colombian National Cancer Institute. Rev Colomb Cancerol 2010;14:65-77. Ozluk Y, Pehlivan E, Gulluoglu MG, Poyanli A, Salmaslioglu A, Colak N, et al. The use of the Bethesda terminology in thyroid fine-needle aspiration results in a lower rate of surgery for nonmalignant nodules: A report from a reference center in Turkey. Int J Surg Pathol 2011;19:761-71. Crowe A, Linder A, Hameed O, Salih C, Roberson J, Gidley J, et al. The impact of implementation of the bethesda system for reporting thyroid cytopathology on the quality of reporting, ′risk′ of malignancy, surgical rate, and rate of frozen sections requested for thyroid lesions. Cancer Cytopathol 2011;119:315-21. Firat P, Cochand-Priollet B. The Bethesda system for reporting thyroid fine needle aspiration cytology: A study comparing the results of two centers from two different countries. Ann Pathol 2012;32:e29-34, 415-20. Theoharis CG, Schofield KM, Hammers L, Udelsman R, Chhieng DC. The Bethesda thyroid fine- needle aspiration classification system: Year 1 at an academic institution. Thyroid 2009;19:1215-23. Rabaglia J, Kabbani W, Wallace L, Holt S, Watumull L, Pruitt J, et al. Effect of the Bethesda system for reporting thyroid cytopathology on thyroidectomy rates and malignancy risk in cytologically indeterminate lesions. Surgery 2010;148:1267-73. Bongiovanni M, Piana S, Spitale A, Valli R, Carlinfante G, Gardini G. Comparison of the diagnostic accuracy of thyroid fine-needle aspiration in follicular-patterned lesions using a 5-tiered and a 6-tiered diagnostic system: A Double-Blind Study of 140 Cases with Histological Confirmation. Diagn Cytopathol 2014;42:744-50. Boonyaarunnate T, Olson MT, Ali SZ. ′Suspicious for a follicular neoplasm′ before and after the bethesda system for reporting thyroid cytopathology: Impact of standardized terminology. Acta Cytol 2013;57:455-63. Ho AS, Sarti EE, Jain KS, Wang H, Nixon IJ, Shaha AR, et al. Malignancy rate in thyroid nodules classified as Bethesda category III (AUS/FLUS). Thyroid 2014;24:832-9. Hyeon J, Ahn S, Shin JH, Oh YL. The prediction of malignant risk in the category "atypia of undetermined significance/follicular lesion of undetermined significance" of the Bethesda System for Reporting Thyroid Cytopathology using subcategorization and BRAF mutation results. Cancer Cytopathol 2014;122:368-76.